Staging Solutions is one of the proud event production companies to be a part of hosting Super Bowl LI in our great city of Houston, Texas! We’re excited to share our city with so many amazing visitors. 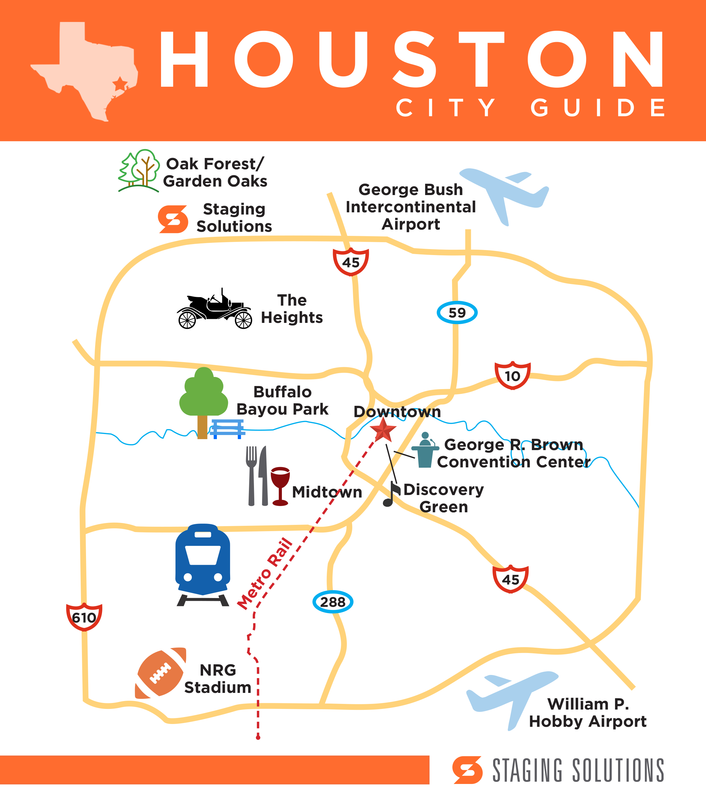 Here’s your go-to guide for all things Houston. Scroll all the way to the bottom to see a map of Houston’s hotspots! As the fourth largest city in America, our airports are a crucial part of connecting Houston to other cities both domestically and globally. If you’re starting your journey at either of the two main airports, make sure to check out the Super Bowl Countdown Clocks that Staging Solutions was a part of activating. With just a short drive away from downtown Houston, Hobby airport is the city’s oldest airport facility. Houston is a focus point for Southwest Airlines and just opened it’s first international terminal at Hobby. Also referred to as IAH, this airport is the tenth busiest in the US. Bush Intercontinental is a hub for Spirit Airlines and United Airlines. It’s located 23 miles north of Downtown Houston, so it does require a bit more of a drive than Hobby, but flies to a larger array of places. Houston is not known for being a walking city or for having a convenient subway, but slowly it has been changing it’s tune. A light-rail has been constructed over the past few years and now runs three different lines that efficiently and easily connect distant parts of Houston together. Walking trails are also taking over the city from the newly re-done Buffalo Bayou Park along Allen Parkway through to Downtown. This park is over 160 acres of trails, skyline views, dog parks, play areas and more. On a beautiful day there is no place prettier in the middle of the city to get away from it all. The Heights promotes walkability as well and has a trail over two miles long right down the central Heights Blvd. Another trail cuts diagonally through the neighborhood from north Heights all the way underneath I-10 towards Downtown Houston, ending at UH Downtown. The METRO put together a guide for Super Bowl here. From January 28 – February 5 you can count on even more trains and an array of services. Houston also has Uber which is sure to be busy during the festivities! The Heights is a historic neighborhood in Houston that dates back to the 1800s. In the past few years, The Heights has transformed from a quaint neighborhood to a hub for young families and millennials. Jump on the two main drags, 19th street and White Oak, for a fun afternoon stroll or night out. Aside from the many great antique stores that line heights’ streets, there are a ton of restaurants that need to be checked out. One of our favorites is Eight Row Flint on Yale. Once a gas station, this updated icehouse is the place to go for mouth-watering tacos, rare bourbons, craft beer, and great cocktails. If you’re looking for great shopping, walkability, and people-watching then you’ve come to the right neighborhood. Downtown is a huge draw for those who are interested in world-class theatre, live music, and great food. With an amazing theatre district in its repertoire, Downtown also has its own aquarium and is adjacent to the newly re-done Buffalo Bayou. Not to be out-done by Buffalo Bayou Park, Discovery Green is it’s own force of nature. This inner-city park is 12 acres that has redefined two large parking lots into a place for houstonians to play instead of work. The park opened in 2008 and is home to a seasonal ice-skating rink, multiple play areas, a dog park, The Lakehouse restaurant, and more. It also is home to one of our Super Bowl Countdown Clocks! The Conservatory is a new-to-Houston establishment located underground in a great location downtown. Head downstairs and choose from an array of food and drink choices. Things you can find at The Conservatory are ramen, savory and sweet crepes, an expansive beer garden, among more fun choices. This is a great place to take friends who can never decide on what to eat. OKRA is a not for profit bar located near Market Square Park. Buy your drinks, take your drink token, and pick a non-profit organization to donate to! Every month the non-profit with the most tokens gets the proceeds from the next month. La Carafe is believed to be the oldest bar in Houston. Ghost hunting and sipping wine and beer go hand-in-hand at this bar every day of the year. Pastry War is one of the best tamale joints in town, but is most widely known as a great tequila bar. Don’t be fooled by the name – there are no pastries on the menu, only some great queso, nuts, and tamales. Midtown is a diverse hub of exciting restaurants and bars. Rubbing up next to the museum district, Midtown also hosts a fair share of museums and art studios. 13 Celsius is a tucked away wine bar that serves an amazing cheese plate, and even has the option for you to make your own s’mores. Its dim lighting sets the mood for an intimate date night. If you’re in the mood for breakfast, you have to stop by The Breakfast Klub. It is an iconic soul food establishment that you can’t go wrong with. This is one of the best breakfast restaurants in the nation, so don’t mind the line, just embrace the vibe! Weights + Measures is a fusion of four different individuals – a baker, a bartender, a chef, and a developer. The outcome is a warm atmosphere with ‘60s decor. Check out the bakeshop where you can get a range of delicious breads and pastries all day long. Brunch, lunch, and dinner all have great options that will appease everyone in a group. The pizzas are a hit, and the drinks are a great companion. Travel North on Kirby or Buffalo Speedway to find shopping and dining in the NRG Park area. Rice Village is a popular area that is full to the brim with a mix of local and chain restaurants and retail stores. Find local favorites like Lily Rain and Emerson Sloan for gifts and unique finds. As far as dining goes, this area has a huge array of options. There is a huge greenbelt along Brays Bayou North of the NRG area. This is great for those who like to get outdoors for a walk, run, or bike ride. Liberty Kitchen, which quaintly sits on a residential street and is a favorite among locals. Cottonwood is another staple in Garden Oaks/Oak Forest and houses an expansive patio, upscale pub food, and unique drinks. We love this area and are happy to have tons of space around our office to be able to throw great parties, enjoy fajita friday outside, and still be close to the loop! Gatlin’s Barbecue we’ve had many amazing office lunches courtesy of this Houston staple for barbecue.